Anything in the great outdoors! these are the starting points. some fine tuning may be necessary. nice! that would sure put a smile on my face every time I needed to run into town. I doubt any of the other cars in the parking lot give the same level of happiness. the late 90s seems like it was the peak of comfy-ness for chrysler seats. I loved the seats in my old 97 town n country. 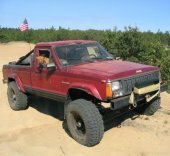 you don't have to limit yourself to XJ seats, or even Jeep seats. The junkyard is FULL of comfy seats that you can adapt in. chances are those backup lenses are just super fogged up. do you have power going to the reverse bulbs? power coming into and out of the switch? those should probably still function so people know you're backing up in a parking lot. and I would totally put those into that bumper as aux lights. I can't wait for the day I can putter into town with an MJ pulling an MJ didn't someone on CC once make an emoticon of that? 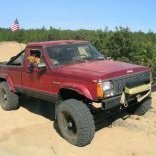 the wheelbase is a real sticking point since the chassis they are designed for is more XJ length. where are the people with 3D printers! I think what I would do is make one for myself and then put it up for sale to see if someone bites. As long as you make it something you'd like to have, you win either way.